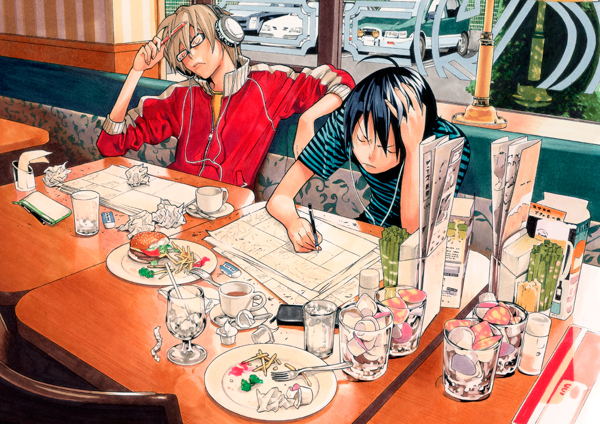 SJ Alpha picked the brains behind the wildly popular Bakuman manga series, Tsugumi Ohba! Tsugumi Ohba is one of the most mysterious creators in Shonen Jump history. He first made his name known as the storywriter of the controversial cat-and-mouse suspense series Death Note. The story-driven manga series truly comes to life with the help of his partner, illustrator extraordinaire Takeshi Obata. Now that Bakuman is over, Ohba Sensei, for the first time in America in an SJ Alpha exclusive, shares his thoughts about the series, his work, and about himself! Q: Tell us how you first became interested in becoming a mangaka (manga artist). Tsugumi Ohba (TO): When I was a kid, I read a lot of manga and always looked up to the creators. But what made me actually want to create manga was when I became an adult and realized I needed to work to survive, and normal work didn’t appeal to me. Q: Do you have a manga-creating mentor for manga? 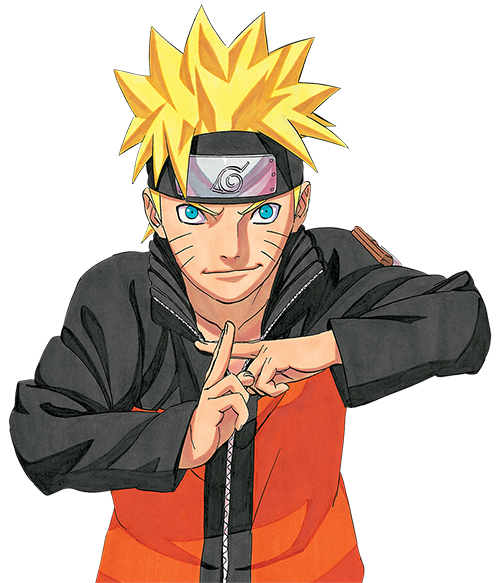 Or is there any particular manga that influenced you? TO: I don’t have a specific mentor, but I was heavily inspired by creators like Shotaro Ishinomori, Fujio Fujiko, and Fujio Akatsuka. Q: Tell us about Takeshi Obata. How did you become partners with him? Also, do you think he has matured as an artist since Death Note? TO: My impression of Obata Sensei is that he’s a very serious and sensitive person. I cannot express how lucky I was to have him do the art for my series. I cannot pretend to know so much that I can say he improved and in what way, but I do believe his ability to express himself through art continues to get better and better. Q: Tell us about your process for creating manga with Obata Sensei. How do you guys hold a meeting? Do you ever disagree with each other’s opinion? TO: I do not meet with Obata Sensei. I discuss things with my editor and create the storyboards. They are then given to Obata Sensei who creates his own storyboards and passes them on to our editor and me. Only minor changes are made and we never have any disagreements. Q: How did you decide to create a “manga about manga” with characters who are mangaka and editors? What was the Weekly Shonen Jump editorial team’s reaction when you presented a new series with such an unorthodox style of storytelling? TO: I thought about how many people want to become manga creators and how I could create this story since I’m in the industry. I don’t know what the reaction from the editorial department was, but my editor's reaction to the first chapter was a lot better than I had nervously expected. Q: How do you feel about the “manga about manga” being successful overseas like in America? TO: I can only be surprised by the success overseas. I believe it’s because of the success of other manga sold throughout the world. Q: How do you come up with the plots and setting for the manga within manga? Have you ever created storyboards for these stories like you would for a real-life manga? TO: I would make excuses to myself that as a manga within a manga, the plot and settings didn’t actually need to be really awesome, so I just did my best to crank them out. I actually created and reworked storyboards for The Classroom of Truth. I also worked on a storyboard for a chapter of Otter No.11 that actually appeared in the magazine. Q: In Bakuman, there are many characters who are mangaka. Do you have any models for any of them among the real-life Shonen Jump mangaka? TO: To be honest, I can’t make a comparison. Q: Which mangaka character in Bakuman do you feel is closest to yourself? 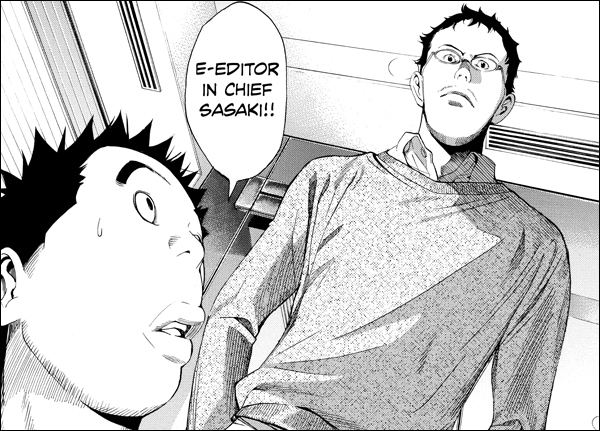 Q: “Editor in Chief Sasaki” is a character based on an existing person. What’s he like in real life? What was his first reaction when he saw himself in Bakuman? TO: Sasaki is always smiling when I see him, so I think of him as a really nice guy. And other editors also tell me he’s always smiling, but that, of course, when he needs to, he can get pretty scary. I don’t know what his reaction was when he first saw himself in the manga, but I was never told that he liked it, so I just imagine that he didn’t. But I assume that he figured having the real editor in chief appear would make the manga better, so he put up with it. Q: Do you have any advice to those people out there who want to become mangaka? TO: You can’t be the one who determines what’s good and what isn’t, so I think you just need to create as much as you can. And don’t be shy. Share your creations with as many people as possible. Q: What makes you happy to be a mangaka? TO: That you can work and smoke whenever you want. Q: Now that Bakuman is over, how do you feel about it when you look back? What was the most difficult thing about it? What was the best thing about it? TO: It was a weird series. The hardest part was that the story kept getting longer and longer, and I had trouble coming up with new ideas. But thanks to that I was able to include stories that I had never initially considered. The best thing is that hopefully there are many readers who really enjoyed it. Q: What do you want to do after Bakuman? TO: First, I’m going to rest. Then I plan to create at least one more new series, so I’ll be working hard on that. 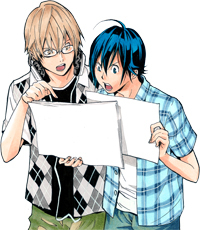 Q: Last but not least, what is the message that you want the readers to take back from reading Bakuman? TO: If you have a dream and work hard for it, I don’t think it’s ever a waste, even if things don’t go as well as they do in manga. That’s how I feel. To read more great creator interviews, become an SJ Alpha member today!